Finding the radius of a circle without special tools is not a trivial matter, unless, of course, you are aware of a Sangaku problem. Sangaku, a mathematical tablet in Japanese, was an art form that flourished during the period of self-imposed seclusion that lasted about 200 years. No one exactly knows how the tradition came about. The purpose might have been to challenge the contemporaries or please the gods. However, the one presented by the applet below seems to have a very specific and practical application: determining the radius of a circle with paper folding - an ancient Japanese art form. XP = (1 + k²) / (1 + k). (1) NP = k(1 - k) / (1 + k). which, when applied to triangle XCP gives exactly (1). 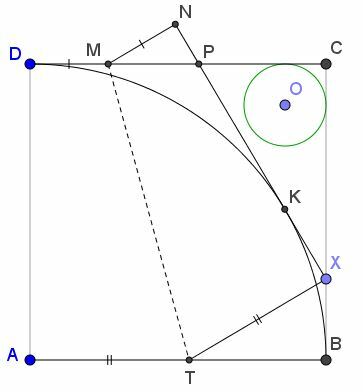 It follows, that if the corner A is folded into a point X such that the edge XP of the paper touches the given circle, the protruding piece NP will give exactly the radius of the circle. A geometric solution has been suggested by Nathan Bowler. CP + XP + XC = CD + BC = 2. (2') r = s - c = s - XP = 1 - XP. However XN = AD = 1, so that 1 - XP = XN - XP = NP. The tablet on which this problem was depicted in 1893 in the Fukusima prefecture still survives, and is described in 1967 publication by Akira Hirayama and Hachio Norii, with a reference to an earlier manuscript with a probable title of Reikan Sanpo Syokia (Correction of Some Problems) by Teisuke Hagiwara. For the sake of comparison, I include that proof below. r·MP = r0·PX = r0·(NX - NP). It is not at all obvious that the above construction is based on the axioms of paper folding. Can this be done, or is it a paper folding neusis construction?